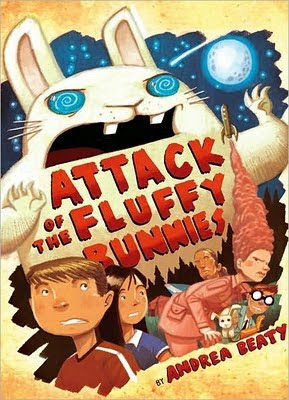 Attack of the Fluffy Bunnies is now in paperback!! Chapter 1 begins, "Meanwhile, in space..." as a meteor hurtles through the darkness. Chapter 2 begins, "Meanwhile, to being our story..." and precedes a two page chart (taken from The Illustrated Guide to Fluffs and Other Space Creatures You Don't want to Meet by Professor Donald J Dewdy - see what I mean about the names?) outlining the main characteristics of a Fluff. Basically, Fluffs are enormous "fierce warrior rabbits whose long, floppy ears are for slapping. Whose long, floppy feet are for stomping. 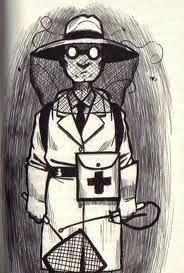 And who large eyes spin in opposite directions to hypnotize unsuspecting prey. Oh yeah, and they have fangs." The Fluffs live in hot-chocolate marshes on a series of planets in the Mallow Galaxy. The planets in this galaxy, a galaxy with a radiant energy source of "sweet candy goodness" that comes in the shape of a giant, square Starburst, have a "sucrose-based core" which the inhabitants naturally feed off of. When the meteor hits the Fluffs' giant marshmallow of a plant, you can imagine what happens. The three remaining Fluffs, Floopsy, Moopsy and Commander Cottonswab, communicating through mind waves, board an aging rocket that had landed on their planet years earlier and attempt to escape the gooey inferno. They pile into the rocket where they find a big red button with this message underneath: PUSH IN CASE OF FLAMING METEOR ATTACK, TENNIS ELBOW, OR INVASION BY SWEDES. That is enough to entice them to push the button and begin their hurtling journey toward earth. On earth, Joules and Kevin Rockman, horror movie loving twins who are the "highly unsupervised" (but remarkably responsible) children of SPAM loving scientists, are packed off to a questionable summer camp while their parents attend the annual SPAMathon in Cheekville, Pennsylvaniam where they hope to win the International Dessert Competition with their Cherry-Cheese SPAMcakes. Camp Whatsitooya, on the shores of Lake Whatsosmelly has a fascinating history but a less than enjoyable present. Run by Mrs Jones, a passionate believer in self-improvement through crafts, leads the campers in activities at Craftland each day while Counselor Jammer heads up water sports and Counlselor Blech (left) leads outdoor exploration activities. Whatsitooya has a small host of quirky campers. There is SmellyCat, actually three girls named Sam, Ellie and Cat, who all talk at the same time so that their names come out sounding like one, a language refered to as Gigglesnort.. There is Mitzy, also a dedicated, untidy crafter who Joules can only think of as Sparkletooth after finding herself distracted by all the glitter stuck to her person. There is also Nelson, a somewhat hapless bumbler who means well. The Fluffs' rocket lands very close to Camp Whatsitooya and things begin to go wrong in a quietly mysterious horror-movie way. Candy and campers go missing, adults begin acting weird, a plastic container of SPAM sauce begins to change its chemical composition and an abandoned building is discovered. This building, once the home of the E.A.R.S. (Earth-Alien Radio Satellite). This project, run by Professor Dewdy, monitored the data sent back from a research rocket that was exploring alien life-forms on other planets. IT was shut down by the government decades ago, but left fairly well stocked. It is here that the final showdown between the kids and the Fluffs takes place. The MacGyver like contraption that the kids build to thwart the Fluffs is truly amazing. And, as the illustration to the left indicates, this is a book with a happy ending. For Joules and Kevin, anyway. When I was preparing to write this review I thought to that it would be a quick and easy one since this book is relatively short and has several full page illustrations, charts and other special inserts that break up the text. When I actually started writing, I realized that Andrea Beaty has written a very rich and detailed story with many aspects worth sharing. I didn't even get around to telling you about how Joules and Kevin (who was supposed to be named Kelvin) got their names or their quirky personality traits. While Kevin is an organized list maker, Joules is "more likely to poke a situation with a stick to see what would happen." And she does, literally, more than once in the book. And there are more hilarious things done to, with and for SPAM than I can begin to recount here. At first glance, Attack of the Fluffy Bunnies is the fun, funny book that it appears to be. Once you, dig into the meat of it, however, (no pun intended?) what you find is a well written, highly descriptive, superbly illustrated entertaining book. And believe me, there are very few kid's books on the shelves that are chuckle worthy. I loved what you wrote about expecting the review to be simple to write, and then in the process of writing it it became even clearer what a great book this is. I go through a similar process quite often, and I always take it as a sign I've struck upon a really fantastic book that's worth sharing. So thanks indeed for sharing this! You are welcome! And I think you are right - it is a sign of a special book. And a pleasant surprise!